Massachusetts Oyster Project: Two Nantucket Lightships? When visiting Wareham to deliver an oyster restoration talk at the local Boys and Girls Club as part of their oyster festival, we were surprised to see a Nantucket Light Ship parked in their Harbor. It was sad to see the ship parked forlornly decaying in place. Nantucket Lightship aging in place in Wareham Harbor. We had heard that the Lightship once docked at the Charlestown Navy Yard had fallen into disrepair and perhaps this was it. But as we began researching the story, we learned that there is two of them floating around. Below is a considerably more uplifting story on the one in East Boston that ran in the Eastie Times. The United States Lightship Nantucket (LV-112) docked in East Boston’s Boston Shipyard and Marina. The ship spent the weekend in New York City and played host to Super Bowl parties. It has become an East Boston landmark and on Sunday it became part of Super Bowl history. The Nantucket Lightship LV-612, which is usually docked here in Eastie at the Boston Shipyard and Marina on Marginal Street, spent the weekend docked in lower Manhattan after a corporate client that attended the Super Bowl between the Denver Broncos and Seattle Seahawks chartered it. The ship and its crew hosted a Super Bowl bash prior to the game at Pier 25 in Tribeca. Since 2009, Eastie has played host to a national treasure. The giant red lightship docked on Marginal Street was declared a National Historic Landmark (NHL) in 1989. There has been a push locally to restore the historic vessel—a project that got a little help last year from students at the Curtis Guild Elementary School. 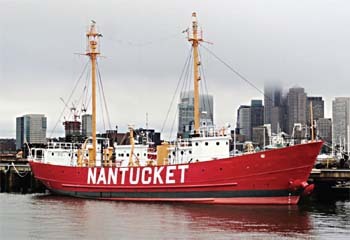 At the time of its NHL designation Lightship Nantucket, also known as Lightship No. 112 or simply LV-112, was the last serving lightship and one of only two capable of moving under its own power. Three years ago the ship, which was docked in Oyster Bay, Staten Island at the time, was purchased for $1 by the United States Lightship Museum (USLM) under the leadership of Robert Mannino, Jr. The ship arrived in Eastie in October 2009. Fourth grade students from the Curtis Guild visited the Nantucket Lightship last year with their teachers for a field trip. The 4th graders were so inspired by their visit they wanted to help with the ship’s fundraising efforts. In conjunction with their teacher, John Rogers, the students generously donated their toys to sell at the school store, intended to raise money and directed towards LV-112’s restoration costs. The total cost to restore the ship back to its original glory will cost $1 million over the next several years.This is the second year that students and teachers from the Curtis Guild have visited Nantucket Lightship on class field trips. The U.S. Lightship Museum’s primary mission is to restore and preserve the Nantucket Lightship as a National Historic Landmark, National Treasure and operate the ship as a museum and floating educational center in Eastie that is open to the general public. In addition, the museum is currently providing interactive educational programs for grade school students and under-served youths in Boston, especially in the Eastie. When LV-112 was a commissioned U.S. Coast Guard lightship from 1936 -1975 based in Boston, it was also utilized for marine biological, and environmental research by Woods Hole Oceanographic Institution.